My new boots came in the mail. They were far too small. I felt like a kid again and my feet had grown over the summer. These boots had everything I wanted. Leather, waterproof, and insulated, I expected to keep them for years. But of course, they had to fit right. Luckily, the online retailer made the exchange simple and free. I mailed the boots in to try a second pair, and I waited. It was going to be a cold, snowy Thanksgiving in Wisconsin. Last week on PRL, we discussed Hopkins’ career in medical advertising. After seeing all the cash being made by his own advertising efforts, Hopkins gets interested in his own profits. Chapter Eight, Hopkins is recruited to work at Liquozone, a failing company selling another medical tonic. 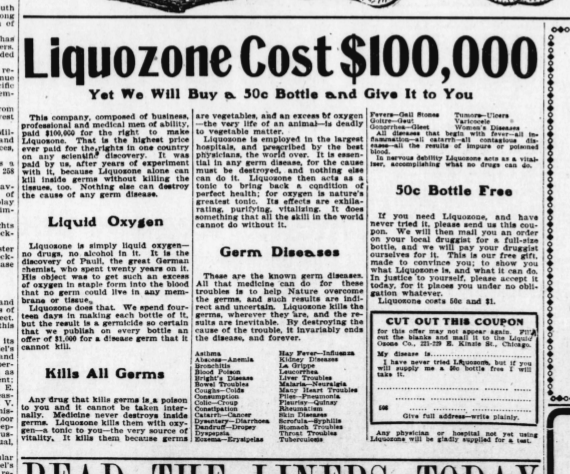 Liquozone was Hopkins’ own medicine company after investors really spent $100,000 to buy the product rights for the US market. Hopkins creates a new scheme for Liquozone, where six bottles are available for $5, guaranteed to work. Again, he has a druggist sign the paperwork for the guarantee, lending authority to the tonic. “I had a proposition which no reasonable person can refuse.” Hopkins insists that a salesman should remove all attempt of protecting himself in a deal. Make an offer that the buyer should not reasonably refuse, and the sale is easy. Successful people look successful from the outside. They only get that way by making (and learning from) many, many mistakes on their way to greatness. Claude C Hopkins made many mistakes in his career, as we’ve learned while reviewing his 1927 book, My Life in Advertising. Most of Hopkins’ mistakes were small marketing and advertising tests. They were intentionally designed to have a successful outcome and a failed outcome, to refine his ads and better hone his craft. Chapter Eighteen, Hopkins’ Great Mistake. At age 21, Hopkins is advised by his boss, Mr. Bissel, to not get tied to the company. Hopkins remains an employee over the next decades while he watches others in his field build their own firms. He laments that he’s taken many risks that bring reward to the vendors or failure to the ad-man, while the ad firm gets the lion’s share of the earnings. Hopkins wishes he had struck out on his own. He eventually did, starting a successful cosmetics company. This is the fifteenth part in a chapter-by-chapter summary of Claude C. Hopkins’ My Life in Advertising. First published in 1927, this book was as insightful then as it is today. I encourage you to sign up for PRL to learn more about persuasion and influence today! After reviewing Hopkins’ accomplishments, we get to the most important chapter of the book, Chapter Seventeen, Scientific Advertising. Hopkins compares advertisements with salespeople. Each must prove their worth. Track results to know what is effective and what is not. Some techniques won’t work in various industries. But some truths are universal. Hopkins lays them out in this essential chapter. I don’t know about you, but I’m wary of ads that push the status quo. “Everything’s OK,” they say. “We’re the brand you know and trust.” Those brands aren’t working to keep our business. Advertisements with selfish appeals don’t interest a reader. Advertising great Claude C. Hopkins stresses service in advertisement. It’s a theme throughout his book My Life in Advertising. Hopkins applied this service outlook in his advertisements and his career. Hopkins’ great success comes from service to others, not to himself. Chapter 16, “Reasons for Success,” focuses on the business of advertising. The influential advertising person, you, must serve three interests. I really like buying things. Things I don’t need, things I do need, things I think I’ll need later. A delayed delivery doesn’t stop this — Kickstarter hasn’t been my wallet’s best friend. YOU can be 10% more knowledgeable about advertising giant Claude C Hopkins’ Secrets to Success with this one PRL post! This is the 11th post in a series covering the current PRL book selection, My Life in Advertising. Chapter twelve of My Life in Advertising, Hopkins works on the Palmolive soap account. Following Hopkins’ playbook, the ad agency offers to buy the beauty soap for whomever brings in a coupon. Palmolive uses this offer to force quick distribution in retail stores, because no business wants the customer going elsewhere. The customers become hooked because the rule of reciprocity says that something done for them, the free bar of soap, will increase their desire to give back. This is the 10th part in a series covering the current PRL book selection, My Life in Advertising. Over 100 years ago, steam-powered automobiles were a novelty to many and a luxury to the few who could afford them. With time, the technology improved and the cost dropped. Do you like to barbecue? How about baked beans, do you like them? I like baked beans especially at a barbecue. They’re sweet, with a touch of tomato, brown sugar, and pork. They remind me of summer days and paper plates. But I don’t eat baked beans weekly. Apparently in the early 1900s, baked beans were all the rage. People couldn’t get enough. Baked beans were frequently homemade. They would sometimes ferment while cooking. Other times they would explode in the 16 hour cooking process. That didn’t stop anyone.